I was really on my way to Massachusetts this day (Rhode Island was scheduled for Day 3), but it was my best use of time to catch a couple of sites on the way. These were Baptist history sites: First Baptist Church, Providence (right) and the Roger Williams memorial/statue. 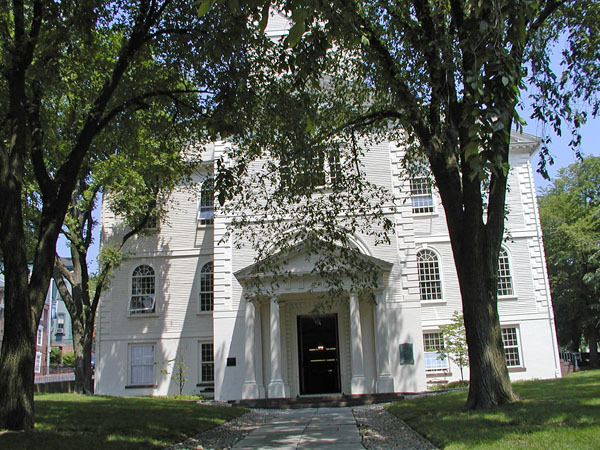 The first Baptist church in (what would become) the United States was founded in 1638 by Roger Williams (not the singer). He didn't stay a Baptist too long, but the church he started continues to this day. The current building was constructed in 1775 and has a beautiful chandelier. I talked with a guide at the Roger Williams Memorial Park who really knew his history -- so many around these sites didn't. To follow along chronologically with my trip, go next to my Massachusetts page. I come back to Rhode Island for day 3. The last day of my trip was divided between Newport and Providence. 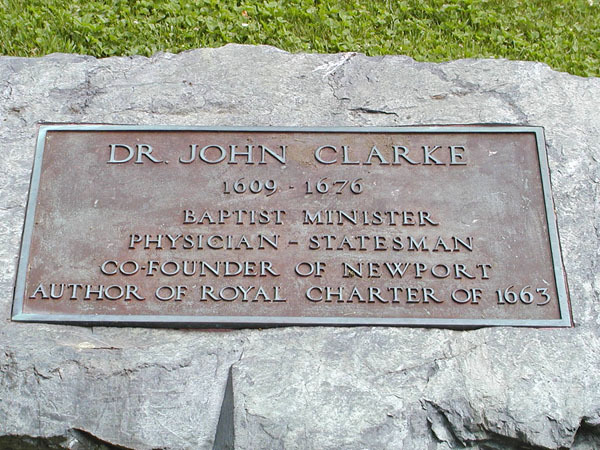 I started in Newport at the grave of Dr. John Clarke. He founded the second Baptist church in the "New World." He also obtained a charter for Rhode Island. His grave is behind a police station in Newport in a small plot near a Baptist church (not the one he started). 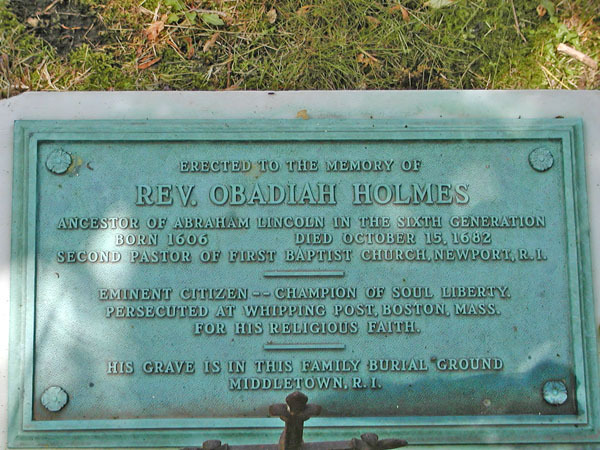 Next I was off to the grave of Obadiah Holmes. He was the second pastor of First Baptist Church in Newport. Also, he was persecuted in Boston for being a Baptist. He's a great champion for religious liberty. Dr. Karen Bullock had found his grave on a trip through Newport. She gave precise directions to it and I found it easily. 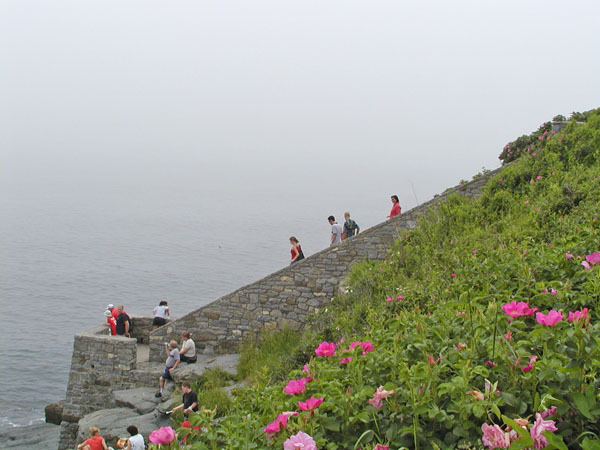 There is more to Newport than just Baptist leaders' graves. This is the famous "Forty Steps." The walk along the cliffs nearby is beautiful and the mansions are fabulous. Before I left Newport, I stopped at the Newport Creamery for lunch. I had heard good things about these restaurants, but I now believe none of it. The staff that I encountered (at least three) were all (at best) inattentive and (at worst) rude. Not all people in Rhode Island are that way, though. See below. My last stop of the day was at the Providence zoo. 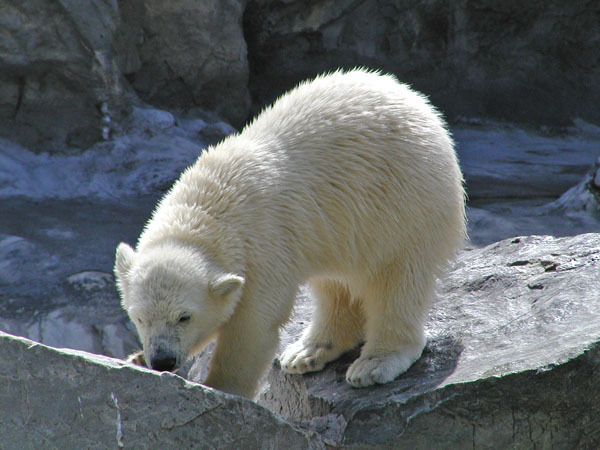 I had heard they had a baby Polar Bear and he was as cute as I had imagined. That evening I had dinner at a restaurant called Friendly's in Cranston, RI. They had a particular waitress at that location that had one of the best attitudes and a most wonderful smile. She really typified the name of her employer. I recommend a visit.